Rain and Fog and Whales! This is where we saw the Belugas on this trip (please excuse the misspelling of Belugas on the map). 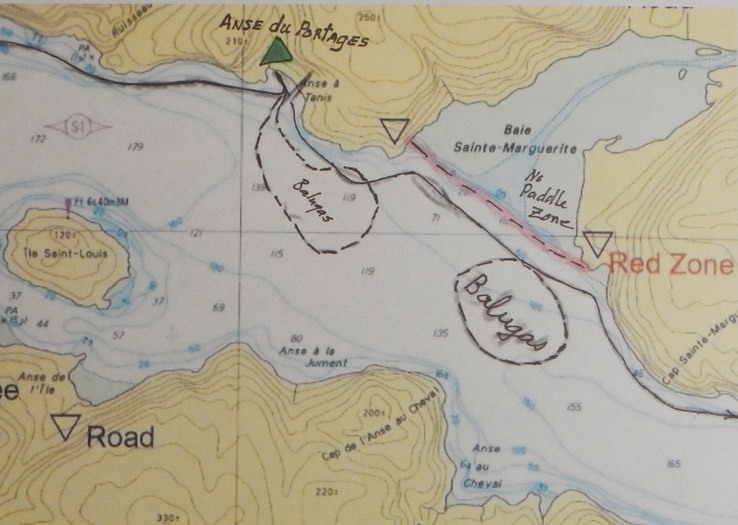 The dotted line on the left shows the area from Day 4 where the quartet of paddlers saw whales. The dotted line on the right is where we saw whales on Day 5. Both areas are outside of the restricted Baie Sainte-Marguerite. The Narrative Report: The rain began about 4 AM. It wasn't a hard rain. Just enough to rouse me out of a shallow sleep. I listened for a while, until a cold drop of water plopped onto my forehead and I sat up. My tent was leaking. I grabbed a head lamp and began to take stock of the situation. Things were really pretty good with only one or two seam leaks; easy to clean up and stay ahead of. It was about 5 AM at this point so I decided to pack up the contents of my tent, getting everything into dry bags. The rain didn't show any signs of stopping soon. My wetsuit would keep me warm and dry, so I pulled it on along with my boots, my paddling jacket and hat, and headed down through the woods to my boat to pick up my breakfast bag. This site thankfully, had a wonderful covered cooking and eating pavilion. Soon the jetboil was bubbling and I had coffee and hot oatmeal to stave off the chill of the morning. We sat around the pavilion for some time, hoping that the rain would stop. The forecast was for the rain to continue, with fog in the morning. The wind was predicted to build in the afternoon and there was a chance of thundershowers toward evening. A bit after 8 AM Bruce called a group meeting to discuss our options. We could stay here, paddle out to see the whales and pull out at Anse de Roche, a small town with a good ramp for cars and boats. Or we could take our chances and head out ASAP, using Anse de Roche as a bail out point if conditions got dicey. With only a little discussion, the group voted to get on the water quickly. It was still raining, so for the first time in my memory I had to knock down my tent in the rain and pack it for travel in my boat. Thank god for the dry bags, as they kept everything else dry, or nearly so. We were all on the water at 9 AM. It was still raining. It was a steady rain, not hard or wind driven. Just steady. It was really quite beautiful in its way. The gray skies, the low clouds and fog gave the place an other worldly quality. 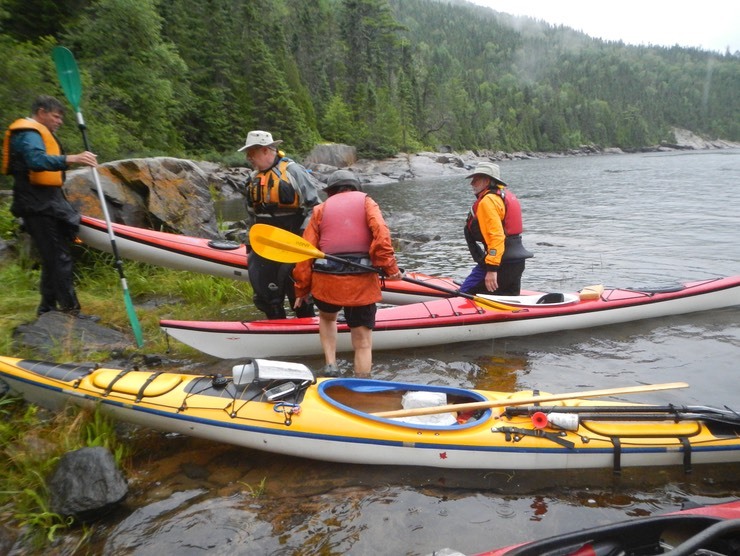 We headed out around a point of land that provided the northern arm of Baie Sainte-Margurite. The bay is deep and its entrance broad. 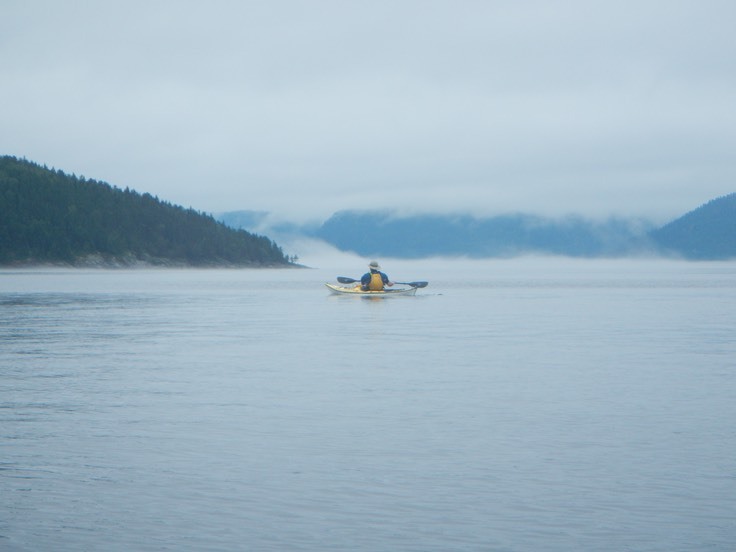 And it is a Beluga Whale sanctuary, off limits to boats of any kind, including kayaks. By drawing an imaginary line between where the North and South arms of the bay met the fjord, we understood where we could and could not paddle. Further, we were not allowed to paddle toward or pursue the whales in any way. However, if they approached us, that was OK. The day began with a steady rain and predictions of high winds and possible thunderstorms. Bruce called a group meeting to decide wether to stay put or take our chances. After we identified several bail out points, we decided to go. Everyone wanted a chance to see the Beluga whales we expected to find outside of Baie Sainte Marguerite. We didn't see any whales right away. But as we moved toward the South arm, we began to see the signature spouts as the whales came to the surface to breath. For some, the experience of the whales was much more personal than it was for others. I saw the whales at a distance, but Robin, and especially Scott had them up close and personal. Scott's boat was surrounded by whales. Whales in front. Whales behind. Whales along side and underneath his boat. What an experience! We speculated that his extra long white hulled boat drew them thinking it was one of their own. I thought that maybe they could read his boat's name - Leviathan! 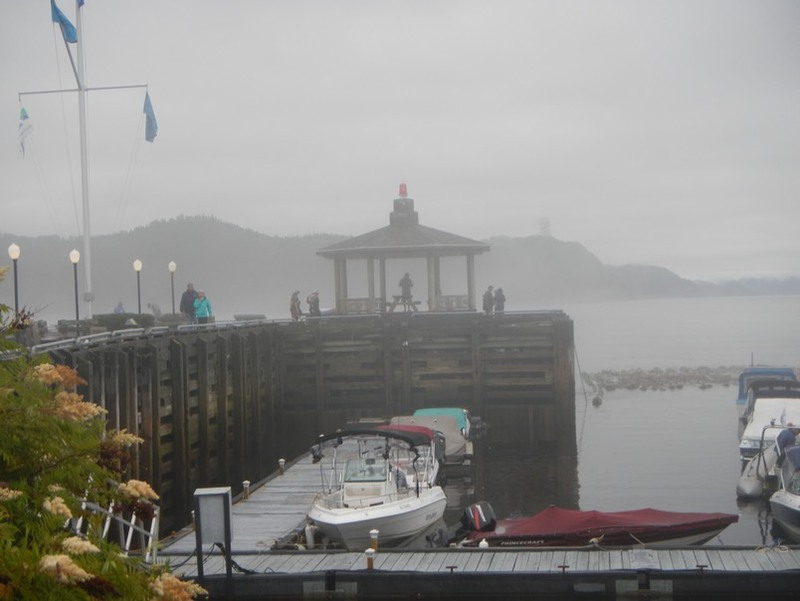 After the whales had gone, the fog intensified. We kept the fjord's high walls close on our left so as to not get lost out on the river. Just at the elbow on the North side where the fjord narrows and makes a sharp ninety degree turn to the right, lies Anse de Roche. Bruce and I had fond memories of this place because we had a fine lunch at the small restaurant on the pier, sitting outdoors in the sunshine with Gaetan and Alan. It was 10:30 when we arrived. The sun wasn't shining. It was cold and damp. But we wanted food anyway. The sign on the restaurant said it would open at 11 AM. It also said it was closed on Mondays. This was Monday. But not a group to give up easily, we hung around till 11:15 on the chance that someone would show up and feed us anyway. It was not to be, so we headed out into the narrows. As we paddled toward Pointe Passe-Pierre, our next campsite, we had to pass through the narrows where the fjord narrows and makes a sharp ninety degree turn. This area can be treacherous (it was on our last trip). This time we only had to contend with wind, rain and heavy fog. The narrows can be the most difficult part of the trip. The combination of current, wind and tide channeled through the sharp, narrow turn in the river can cause a chaotic sea condition. We discovered that on our 2009 trip. This time was different. We had some wind and wave action, but it was pretty easy to navigate. This was a blessing because we needed to stay near the north wall for safety as we passed through. If conditions were difficult as they had been on our last trip, there would have been a significant rebound of waves off the wall. The camp at Pointe Passe-Pierre sits above a finger of land that juts into the fjord. It appears that the landing for the camp is on the approach (northern) side. You can land there. But there is a steep bank to carry the boats above the high tide mark and an equally daunting carry of your gear to get to the camp. If you arrive before low tide a better alternative is to paddle to the other (southern) side of the finger and into a tiny bay there. We had to get out and tow our boats in. This makes for a much easier carry to the high tide mark and an ever easier distance to carry gear. 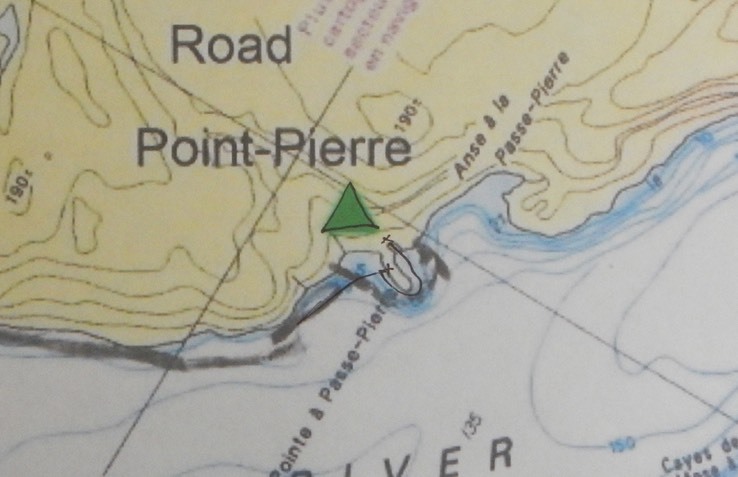 We arrived at Pointe a Passe-Pierre around 1:30. It was still gray, foggy and damp. But the rain had stopped. We were able to set up camp and let our tents dry out a little before dark.